Offer an unstable and sensory-stimulating surface designed to facilitate balance and proprioceptive training and automatic postural reactions. Rocker Board allows for one plane of instability. 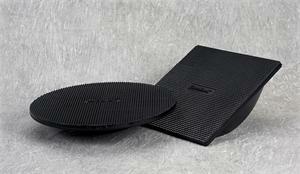 Wobble Board provides multiple planes of instability for the most challenging training. Made of black molded plastic with a specially-designed tactile surface on the top, and an anti-skid surface on the bottom. Illustrated instruction guide with over 37 exercises included.